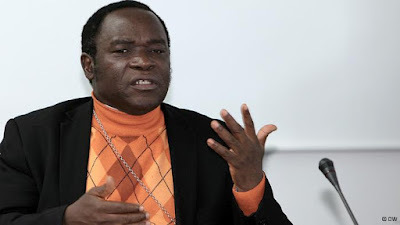 The Catholic Bishop of Sokoto Arch-Diocese, Mathew Kukah, has warned political leaders to govern well in order to avert any temptation by military to take over governance via coups. The Bishop was speaking at a press briefing organised by the Kukah center, as part of a public lecture with theme: “How to make democracy work for Africa,” in Abuja on Friday. Mr. Kukah lamented the worsening state of the country from poor leadership. He added that Nigeria has only survived the democratic dispensation because of the confidence reposed on the system by the military. Mr. Kukah commended the efforts of the military in ensuring almost two decades of democracy and added that political leaders ‘should not take the patience of the military for granted’. “Democracy requires lots and lots of patience and hardwork,” he was quoted by Leadership newspaper as saying. ” And I think we are mightily grateful to ourselves as a people that despite the frustrations, despite the temptations, unlike before: we have witnessed 16 to 17 years of patience on the side of the military because if it were 20 to 30 years ago, we would have had at least three or four coups already. ‘’I think it is a measure of the faith of the military itself on the urgency of democratisation that has kept them in the barracks. But I think the politicians and the political class cannot take this patience for granted. What we have experienced in the last few years has made us a laughing stock of other nations,” he said. According to the report, Mr. Kukah regarded as a tragedy the religious dimension currently experienced in opinions about the poor quality of government. “Adding a religious dimension to the issue by politicians is dubious and criminal. In fact, we do need people with the requisite tools to be in power irrespective of their religion or faith. “Those in power have been holding us hostages, so we need to wake up and take the necessary steps. Our people are too naive to have taken all promises seriously. For example, we were told that corruption would be fought but we never asked questions on how. Nigerians have lost the sense of integrity and courage. We should take seriously the issue of courage in our convictions,” Mr. Kukah reportedly noted.